We are market-leaders in manufacturing, supplying and exporting Worm Gear that are used to transmit torque and rotary motion through a right angle. These worm gears are part of several applications in various industries worldwide. We manufacture these worm gear using premium quality raw material sourced from reliable suppliers to fabricate these worm gear in adherence with industrial set norms and standards. Focused on optimum satisfaction of customer's we provide highly reliable products to our customers by testing them for quality before dispatching. These worm gear are highly efficient in performances and thus are highly appreciated by our valued patrons. In order to fulfill ever changing demands of our clients we are engaged in offering Worm Gear Wheel that are used to transmit torque and rotary motion through a right angle. We manufacture these gear wheels using latest technology and modern tools. Our expertise professionals fabricate these highly efficient gear wheels at our technologically advanced infrastructure, using innovative approaches. 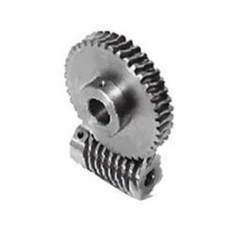 Customers can avail these worm gear wheel from us at reasonable prices. Looking for Worm Gear ?